Last month the Australian Council for Education Leaders [ACEL] Western Australia Branch announced their 2018 annual award winners representing those who have made outstanding contributions to educational leadership. 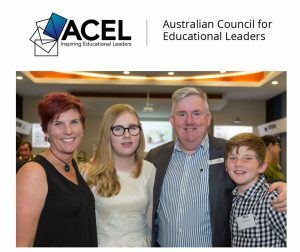 We are thrilled to let you know that our Principal, Paul Whitehead has been acknowledged with the ACEL WA Certificate of Excellence in Educational Leadership being recognised for his many years as an educational leader and practitioner as well as his achievements in leading the team at Bold Park Community School. Paul’s wife Nadine and their children, Chayse (14) and Kaiden (12) were delighted to share in the evening celebrations with AISWA’s Ron & Wendy Gorman also in attendance. Paul was acknowledged at the ACEL West Australian Branch Annual Awards Ceremony by the Education Minister, Hon. Sue Ellery MLC.